The Arts are an integral part of Vintage Elementary School. Selected grade levels participate in Theatre or Dance or Music classes on a weekly basis. These art forms provide students an outlet for self expression while focusing on communication and problem solving skills. Experiences in both formal and informal performances are connected to the curriculum and enhance the learning experience for each student. Vintage is also one of the first schools in the district to be part of the Arts Integration Pilot Program which encourages collaboration between arts teachers and classroom teachers. Teachers work together to design lessons that are reflective of the Common Core State Standards and strengthen students' understanding of classroom curriculum while providing new avenues of knowledge. Common Core are educational standards that describe what students should know and be able to do in each subject in each grade. Forty-five states have adopted the same standards for English and math. Standards have been developed by teachers, parents and education experts to prepare students for success in college and the workplace. 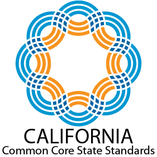 Visit the California Common Core website for more details. Vintage's technology program took off in June 1995 with the dedication of a classroom that was converted into a computer lab. Vintage's program provides a computer for each student. Students learn the basics of using a computer as a tool in their education. 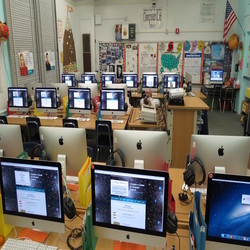 Students attend the computer lab every week in grades 3, 4, and 5 and every other week in grades K, 1, 2. Lessons on how to use technology include popular educational applications such as word processing, keyboarding, desktop publishing, slide show presentations, multimedia presentations, and Internet research are integrated with topics being studied in the classroom. A full time IT Support Technician, Mrs. Stone, helps students and teachers with their technology needs. Additionally, Limited iPads are used in K-1. Chromebooks are used in classrooms in grades 2-5. Students are given an email through LAUSD. Vintage Math Science Technology Magnet provides a cluster model within the classroom for students identified as GATE (Gifted and Talented Education). Parents wishing to learn more about how their child is receiving GATE services should contact their child's teacher or Vintage's GATE coordinators Ms. Rodgers or Mrs. Henry. The Los Angeles Unified School District offers further information for parents about GATE on its website. 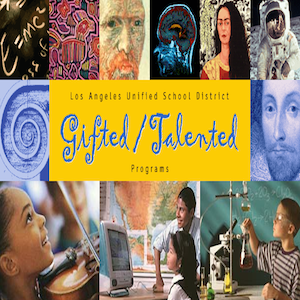 Click here to learn more about LAUSD's GIfted and Talented program. In addition to our emphasis on math, science and technology, Vintage Magnet places a high priority on literacy skills. As a public school in the State of California, Vintage teachers must work to help all students reach proficiency in the state content standards and Common Core State Standards for English Language Arts. 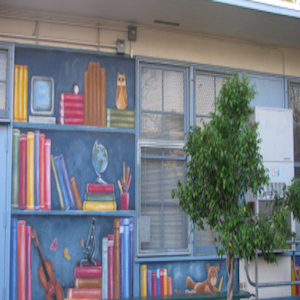 Language Arts is taught through the LAUSD District Reading Program, Treasures. Teachers follow a pacing plan outlined by the district. All teachers collaborate on lessons to insure that same standard of instruction is being delivered in each classroom on a grade level. Visit the Treasures website to learn more. Students take periodic assessments in Language Arts to monitor their progress. These assessments measure fluency, reading comprehension, skills, vocabulary, spelling, and writing. Teachers review the results from these assessments to plan their instruction and to meet the individual needs of students. Vintage uses a set of procedures and measures for assessing literacy skills called DIBELS (Dynamic Indicators of Basic Early Literacy Skills). Teachers use a short (one minute) fluency measure on a regular basis to monitor early literacy and early reading skills. There are seven measures that help teachers identify children experiencing difficulty in acquisition of basic early literacy skills so that they may provide support early and avoid reading difficulties. Visit the DIBELS website to learn more. Our lovely Vintage library was renovated through the Pacific Theater's Wonders of Reading grant. It features an electronic catalog and an amphitheater. Every class visits the library every other week to check out books, do research or listen to a story. It is also the site of many of our meetings and afterschool study programs. Assisting students and teachers is a full time librarian. Check with the librarian if you would like to help out in the library. At Vintage our goal is to provide a rigorous math program that strikes a balance between building student's basic mathematics skills and giving student hands-on experiences through which they can investigate mathematical concepts and develop their problem solving and reasoning ability. Teachers follow the LAUSD Mathematics Instructional Guide. This pacing plan supplements our adopted math textbook series, Pearson enVision, with lessons from various current resources. This pacing plan is designed to cover all of the state standards in mathematics for a grade level in the course of a year. Students take periodic math assessments in the spring and the fall in addition to their classroom tests and quizzes. These assessments let teachers know if students are on track to meet all standards by the end of the year. Teachers meet regularly to plan math instruction based on the results of the assessments. NOTE: The link for the online program for student login access will be coming soon. ​Vintage 4th and 5th Graders receive Robotics Instruction in their classrooms. Instructed by classroom teachers and 1 Assistant with a Mechanical Engineering Degree, we implement a VEX IQ curriculum. Students learn the foundational skills needed to design and build a robot. They will work with a team to complete engineering tasks essential for this growth. VEX IQ Robotics Units are aligned to the Common Core Math Standards, Next Generation Science Standards, and the Standards for Technology Literacy. Beyond the classroom day, interested 4th and 5th graders participate on the Vintage Magnet Robotic Teams. Team competition involves the following components: driving skills challenges, research projects, and Notebooks. The team competes at local competitions with the hopes of qualifying for the State and World Championship Competitions. Science instruction is an important part of the instructional program at Vintage. Teachers follow the state content standards in science at each grade level. Teachers collaborate to plan science lessons that include hands-on inquiry based experiences. Every class visits the science lab each week. The science lab allows teachers to spend more time on concept development and less time on the set-up of materials. 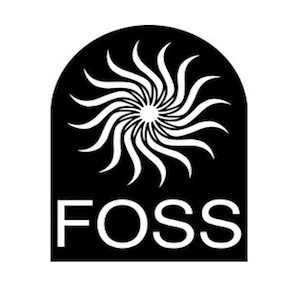 In fall of 2007, Vintage began implementing the FOSS Science Program. This program is the adopted program of the Los Angeles Unified School District. 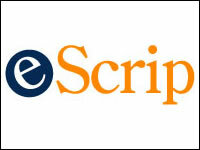 The program is unique from other programs because it focuses on investigation and experimentation rather that textbooks to deliver content. The program divides the school year into three units that focus on earth, life and physical science standards at each grade level. 4th and 5th grade teachers use the LAUSD Science Instructional Guide to plan instruction. This instructional guide is designed to help teachers cover all the science standards in the course of the year. The instructional guide complements the FOSS program and is also divided into strands of earth, life and physical science. Students in 4th and 5th grade take science assessments at the end of each the three units. Teacher use the results of the science assessments to plan future instruction to insure that all students will reach proficiency in standards. Teachers work with a 4th and 5th grade Science Lead Teacher who receive special training which they share with their colleagues to improve science instruction in every classroom. 5th grade students take the California Standards Test in Science in spring. This is a state test that assesses 5th grade students' knowledge of 4th and 5th grade science concepts. In addition to the regular science program, we are constantly seeking ways to provide enriching experiences in science, technology, engineering, and math (STEM) for students. The NASA Explorer School Program is one way that resources are brought into the school to inspire students and create a meaningful context for science learning. A second example is the instructional garden. Students can explore life science concepts by getting their hands dirty planting in the school garden. 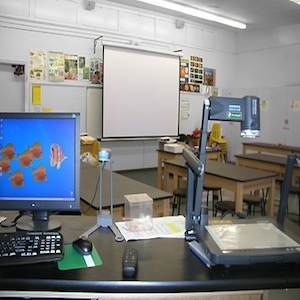 The lab is equipped with a digital projection system for multimedia presentations and a digital microscope, for investigating the world up close. Teachers help students to make real world connections to science concepts by utilizing videos, images and sounds in their teaching. Students learn how to think like a scientist and go through the steps of the scientific process (start with a question, make a hypothesis, write down the procedures, record the results, and draw a conclusion). After working with these steps in the classroom all year long, students do their own science experiment for the Science Fair. Teachers and students are assisted by our hard working science lab assistant who preps for each science lesson.